A Castle, the Sea and a Sunset ...a Wedding Story! 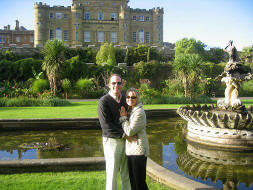 Sara and Briggs celebrated their fifth wedding anniversary with a return to Maybole and Culzean - Sept 2009. See story below. 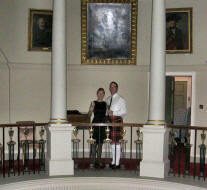 Two years ago, my fiancé and I decided that we wanted to elope to Scotland (we're Americans). We had both always wanted to go to Scotland and we also knew that somewhere back in our ancestry our families were from there. We streamlined our criteria to include being married in a castle, along the sea, and at sunset. That's a tall order, and I immediately began the internet search and ultimately found Culzean Castle...Perfect! We both agreed. So, last September 25, 2004, eleven months after his proposal, Briggs and I were married by Reverend Arrick of Kirksowald Parish at Culzean Castle overlooking the sea. And just as we hoped it would be; it was perfect (the sun made a last minute appearance after raining all day, just in time for our outside ceremony). 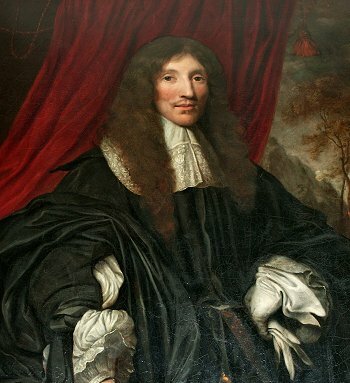 While having our pics taken in the castle, we noticed a framed portrait on the wall of William Cunningham, the 9th Earl of GlenCairn. Jokingly we asked Robert (our photographer) to take a pic of "Uncle Bill" for us. He did, and included it in our wedding pic disks. 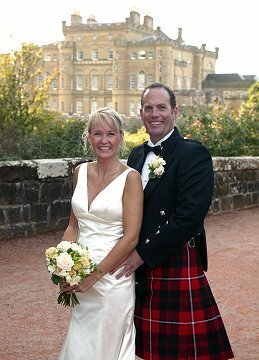 Sara and Briggs celebrated their fifth wedding anniversary with a return to Maybole and Culzean in September 2009. See text and photos below. Click on the photos to view full size. 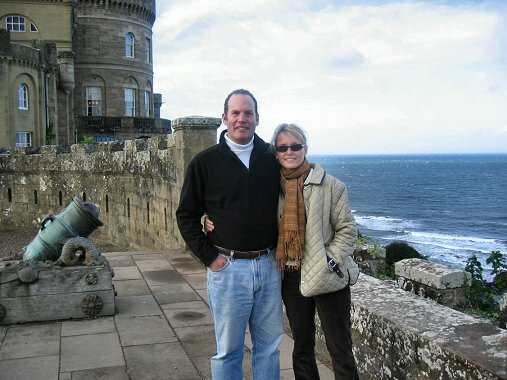 Briggs and I had an absolutely amazing time in Scotland once again on our return in the Year of Homecoming - 2009, to celebrate our fifth wedding anniversary. We dined twice at the Maybole Arms (i.e. best steak pies in the world! ), visited Arrick & Nan at Kirkowald Parish and communed with the ancestors at Culzean Castle. We had such a fabulous time and are already making plans to return (with all of our children!) -- we want each of them to know and love this wonderful place as much as we do!! Callum, his dog; Harley, and myself standing in front of his pub. Briggs and I went back the following day to have a repeat of the steak pie! Culzean castle grounds, standing in front of the (now broken) clock tower at the exact time that we had been married there 5 years ago. Dinner at Turnberry later that evening.